Are you struggling with obstacles on your path? Introducing Pathfinding II: The Ganeshification! 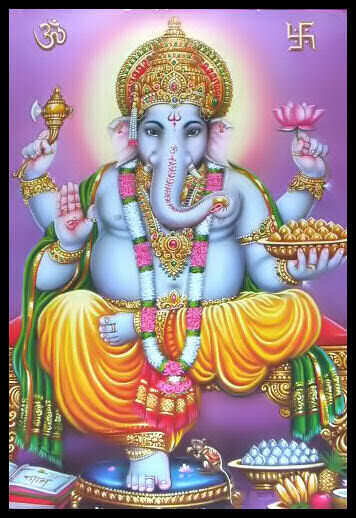 Ganesh is the Remover of Obstacles. During this 6-month program, we will clear away the top 1 or 2 obstacles in your path. 1 or 2 obstacles in 6 months? Srsly? Oh yes. We’re not talking about pigeon-size obstacles like “I need some new shoes.” We’re not talking about horse-sized obstacles like “My work environment drains me instead of sustains me.” We’re talking about elephant-sized obstacles. And for elephant-sized obstacles, we need an elephant-sized Remover of Obstacles, plus enough time for deep transformation to take place. You know what kind of deep transformation I’m talking about, because you experienced it in Pathfinding I.
I can’t stay focused on my Great Work because of stupid stuff like Facebook and awesome-but-distracting stuff like learning new things. I can’t stay focused on my Great Work because I’m too busy making ends meet, and I hardly have any time left over. I can’t stay focused on my Great Work because I’m too exhausted all the time, and I hardly have any energy left over. I now know what my path is, and my own business is on it. Now I need to grow my audience and somehow make some money. I now know what my path is, but I’m afraid that I haven’t got what it takes to actually do it. In Pathfinding I, I discovered my path. But I’ve been slipping back into old patterns and ways of doing things, and I’m afraid I may have wandered off the path. What if you could remove those obstacles? What might it feel like to walk on a clear path forward, instead of constantly bumping into these same big boulders? In Pathfinding II: The Ganeshification, I’ll help you remove those obstacles. We’ll build on what you learned in Pathfinding I, and apply that knowledge directly to the obstacle that’s blocking you the most painfully. Well, you already know what working with me is like from Pathfinding I, and Pathfinding II is only open to people who have completed Pathfinding I. In Pathfinding I, you found your path, and you learned how to access your inner Compass for guidance. You took some bold steps onto your path, and promptly ran into some elephant-sized obstacles. We worked together on getting around those obstacles as much as we could, in the time we had together in Pathfinding I.
Pathfinding II is for you if you’re blocked by a big boulder on your path. Pathfinding II is for you if you’re ready to make some serious progress on your path – significant, concrete, measurable progress – and you’re willing to do the work required to get those elephant-sized obstacles out of your way. Like Pathfinding I, Pathfinding II will be a mix of the sublime and the practical – whatever is needed most at the time. The obstacles blocking you are like thick, thorny vines covering your path. If you hack away at the vines, they’ll just grow back, because their roots are still buried deeply. We’ll need to sing to those roots, encourage them to grow toward the sunlight instead of blocking your way. I try to earn others’ love by being helpful, but I exhaust myself and still feel empty. and rest assured that they’ll stay solved. You experienced Pathfinding I, so you know what kind of growth, learning, and transformation can occur. I’m offering you Pathfinding II because I want to continue to be of service to you on your path. From past experience, I know I love working with you. So I want to make it as easy as possible for you to join this program. 1 individual session per month, for 6 months. Each session ends with a clear task to focus on, so you’ll know exactly what to do to work on obstacle removal. 1 group session per month, for 6 months. I’ll keep this group small enough to make sure that everyone gets a turn on each group call. A private Facebook group to stay in touch with me and the group, and to help each other out. It’ll probably be a mix of some familiar faces and some new friends. Same as Pathfinding I: $297/month for 6 months, or if you prefer, 1 payment of $1782. Dates: The Ganeshification Program begins on November 1st and lasts 6 months. November 1st is Samhain – the Celtic New Year – a great day for new beginnings! Applications are due by Friday, October 19th. Times: To be scheduled. We’ll find a time that works for everyone. Location: Over the phone, via email, and on a private Facebook group. Through my work with Pace, I have developed a strong framework and foundation that can stand up to the storms of life and the rigors of daily living. By starting with a solid base and focusing on one element at a time, I can move past feeling overwhelmed and onto progress. By building each piece separately, I make the whole stronger and the process of building more enjoyable. Through the program, I have learned to trust in my own wisdom and my connection to the Divine rather than seeking answers from external sources. This has freed energy and space for joyful discoveries and for celebrating the present moments. When I relied on external sources, there was lots of conflicting and competing information. This meant that any path I chose was destined to be wrong in the eyes of at least some people even while being right for others. For someone who self-trained to be a black belt in the art of people-pleasing, this was very stressful. Trusting my own wisdom removes the step of figuring out which external wisdom best applies, and learning to trust in my internal wisdom lets me move past this sense of being judged. This frees up more of my mental and emotional energy because I’m not wasting that energy on distracting opinions. Gathering information but trusting my own knowing means that the wisdom I find is tailored to my unique experience in life instead of someone else’s. Trusting my inner wisdom has helped me see that I know how to achieve my goals and build my soul’s home. This work has also provided a new kind of mirror for reflecting my own thoughts and feelings back to me. This allows me to evaluate them more objectively. I’ve gained an awareness of my assumptions, of my habits, of my self-imposed stumbling blocks. I have also gained new tools for navigating decisions (Compass technique, etc.) for working toward and achieving goals. These tools make me better equipped for building my dreams. Perhaps the biggest shift is in my perception. At the start of the program, I was very focused on making the right choice, getting the answer right, choosing the right alternative. Now I see that my path is a a journey rather than a destination. I understand that circling back around the spiral is not “failing” but part of the process. I see that even “mistakes” are part of growing and sometimes lead to unexpected but delightful discoveries. This has given me freedom to take chances and to live more fully. It has taken the pressure off; I don’t have to find the 100% right answer for all time; I can focus on the next step and trust that the step that is right after that will unfold in time. In sum, through the Pathfinding program, I have learned to trust my own knowing as well as gaining new tools and the ability to use them. I have found more courage and freedom in the service to my calling. I have what I need to make the differences that are important to me. How is this different from Pathfinding I? In Pathfinding I, we worked on finding your path, accessing Divine guidance, then working through obstacles on your path. In Pathfinding II, we’ll focus on the #1 biggest obstacle that’s blocking you and heal it until it’s healed. But I don’t feel that way at all anymore. It was exactly what I needed. Over time I realized that we’re all the same in this group, and that we’re each exactly where we are and where we need to be. Pace is great at figuring out where people really are and what they need to move forward. I also really appreciated that it’s low pressure. I would sometimes think, “I didn’t do enough! I didn’t do a good job! Pace is going to fire me!” Whenever I thought that, it turned out okay. We just go from here, what’s going on today, and what’s next? I appreciated that it was always a “where are you at today” kind of thing. So what did I actually learn? Getting centered, internal focus, the whole Compass thing, how to make decisions, how to know if they’re good decisions. Six months is a good amount of time for all those things to get connected up, and now I actually do some of those things throughout my day. I’m glad I made the commitment to the whole six-month program. I’m glad I got through that dip. It all gelled at the end. I promise to be gentle. If a kick in the pants is called for, I promise to kick as gently and compassionately as possible. (: I promise to treat everything you say as sacred and confidential. I know that you have a light inside you that’s bursting to get out, and I want to help you clear away those obstacles so your light can shine even more brilliantly! And I’m confident that if you’re willing to commit to this program, I can help you. But you don’t have to take my word for it! Sprinkled throughout this page, you can read what some of my clients have to say about working with me. You may recognize some of the names and faces. (; Here are two more. You know the drill – fill out an application! It’s just like last time, except this application will be shorter, because I already know you. First, you’ll submit an application. Next, we’ll talk on the phone for a little while. You don’t need to prepare anything. We’ll chat about your situation and talk about how I might be able to help you. This call is totally free (money-wise and commitment-wise). Sometimes, what’s best for the baby bird is to be pushed out of the nest so she can learn to fly on her own. Will this program help you learn to fly? Or would this program be like staying in the nest for you? That’s one thing we’ll work together to figure out during our phone conversation. I’m not going to push you in any direction; you and I will discuss it and figure it out together. So fill out this application, click submit, and I promise I’ll get back to you within two business days. As soon as you submit an application, I’ll hold your spot for you. You can also use the application to submit questions even if you’re not sure you want to apply. Applications are due by Friday, October 19th. What's been going on for you since the last time we caught up? Thank you so much! I appreciate you, I miss you, and I’d love to work together again.